ANIMAL CROSSING: NEW LEAF IS COMING TO THE USA ON JUNE 9TH!! You guys have NO idea how excited I am to play this game in English. While the game is amazing even while playing in Japanese, I can’t wait to understand what my townies are requesting of me, and to be able to write letters that make sense, and to really be able to bond and gossip with Shizue… (ok I made that last one up). It’s gonna be AWESOME and I can’t wait for all of you to be able to join in the fun with me! I fully intend to do some big StreetPass Meetup Events, as well as some WIFI Events to share rare tools and goodies with all of you. When I have all of that worked out, I’ll be sure to let you know! Now, you might have noticed at the end of this video segment was a tie-in to a 3DS game called Style Savvy: Trendsetters that is already available for purchase. 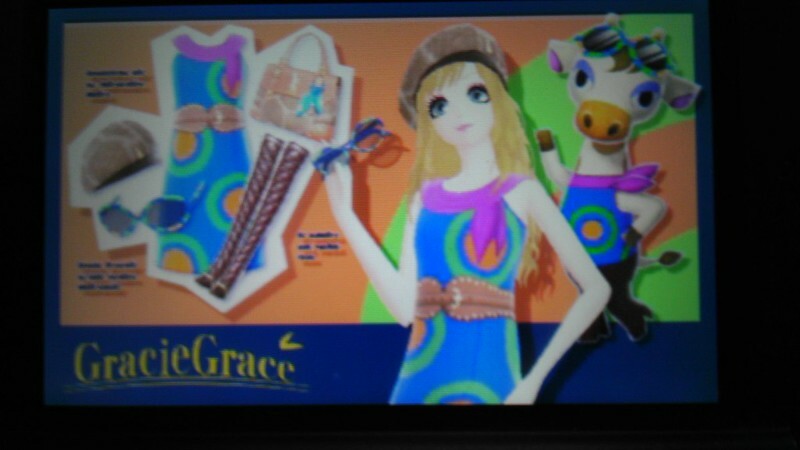 I’d known about the game for a while, but when I saw that GracieGrace fashions would be added to Style Savvy as DLC, I was intrigued. Then I saw that BestBuy was having a President’s Day Sale that offered Style Savvy for the reduced price of $19.99. So of course I had no excuse not to pick it up! Here’s a peek at the GracieGrace DLC pack that was released for Style Savvy this past week. You get the coveted Gracie pattern dress, a pair of knee-high boots, as well as a hat, sunglasses and a bag. I hope we get more Animal Crossing related DLC soon! LOL!! Aww BamBam, it’s surprisingly good! They do have men’s fashions too. 😛 But yeah I can understand the lack of appeal of this game for guys lol!